It was a quietly momentous occasion—the last two kakapo youngsters to be released this season stepping clumsily into new lives in the wild to the fanfare of bellbirds and kaka.Weaned from morning crop-feeds several days ago, the birds left their chick-pens in robust good health. Their first night in the bush was a mild one, the following day sunny, and their particular patch of bush is rich with hidey-holes. Having seen footage and photos of the pair as clumsy (read: falling over their feet), partially feathered fledglings , I can see just how far they’ve come among a record number of 26 hand-reared this season. With understated satisfaction at seeing the last of the youngsters to leave, Steve, Dana and Errol soon start planning the forthcoming weeks; weight-monitoring, feed-outs and data-collection are fine-tuned on a daily basis with all birds’ health at heart. Steve says it’s almost inevitable that the youngsters, who clambered obligingly onto a branch attached to scales each evening in the chick-pen, will keep their distance in the wild. Which is just what a ranger likes to see—even if it does mean wading through waist-high scrub and tangly supple-jack to find the birds. Out and about on the tracks during the day however, it’s not uncommon to come across a kakapo looking a bit awkward in the daylight. After nearly two weeks on Whenuahou I’ve more of an eye for the birds’ green-gold plumage and an ear for the piggy grunts that give them away. Some are roused by the sound of pellets rattling in a feed-hopper, and others (I suspect) by songs sung for the joy of being in the bush. Recently I met Sirocco (a character infamous for his breeding season antics), and sat down to let him pass only to find him circling me twice before coming in for a little nibble. Yet another magic moment on an island saturated with birdlife. Besides running around after loveable parrots, I’ve sat pinned between the stereo phonics of two bellbirds bouncing resonant, rounded balls of calls back and forth to each other. I’ve watched flitty little South Island tomtits through the steam of a mug of tea; seen the sweetest pair of Campbell Island teal, and drifted off to sleep each night to the brays of little blue and Fiordland crested penguins. Evenings and afternoons have passed happily with good kai, conversation, card games, movie nights, music and mad games of petanque. Most importantly, the knowledge, openness and empathy of the kakapo team here paved the way from my first day here as a volunteer. I’d do it all again in a heartbeat. This is fabulous Steph – looking forward to hearing all about it and seeing your pics when you get back to Wellington! Sirrico is coming to Auckland! Kakapo will keep their distance in the wild. Which is just what a ranger likes to see—even if it does mean wading through waist-high scrub and tangly supple-jack to find the birds. Sounds like Sirocco was making the moves on you; he’s one smooth parrot and he knows what the ladies want. Kai-to-go was great reading ! ! Would love to meet Sinbad one day. Sirocco sounds a real character too. Many thanks for your informative weblog. We’ve got a F&B/KCC stand at the Auckland zoo in Conservation Week, and I’m hoping to see Sirocco. Hope he’s got some earplugs with him – lots of kids are expected to visit and I imagine he’ll be very popular! I have never visited N-Zealand but from what I see of all the native birds the land is really blessed, so keep up all the good conservation work of preserving the land for them. I think the Kakapo are cool as well. Rock on and keep saving and breeding and feeding Kakapo.It’s all for a good cause right. 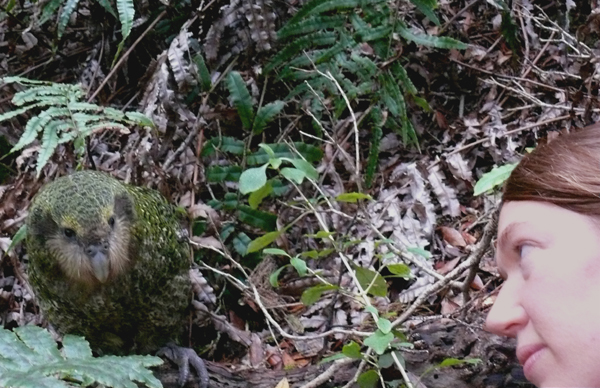 Forest & Bird will be allowed to name one of the kakapo chicks born last breeding season, so we’ll soon be having an online competition to choose its name.